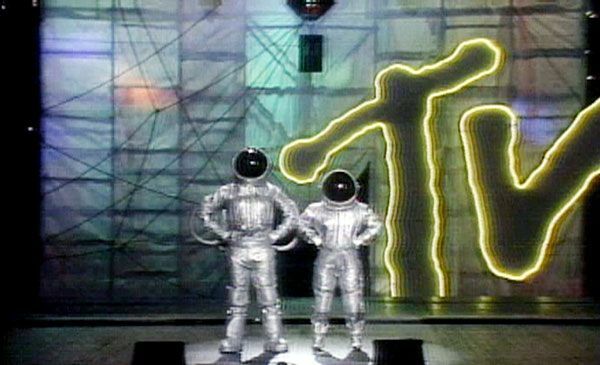 9.14.84, New York: The Moonmen land at the very first Video Music Awards, held at New York’s Radio City Music Hall. 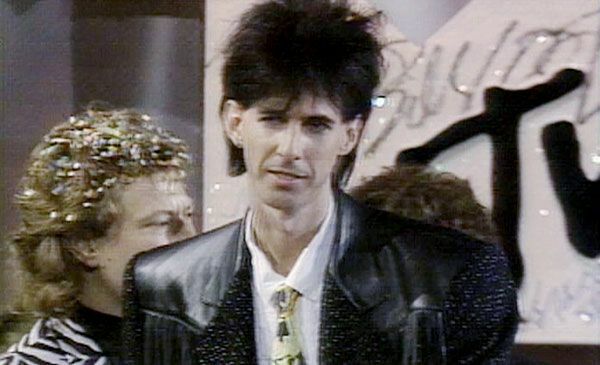 9.14.84, New York: Hey, that’s no Moonman! 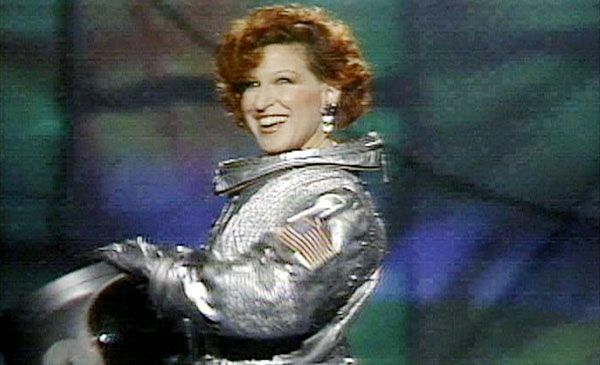 Turns out, it's just the evening’s VMA hosts, Bette Midler and Dan Aykroyd (not pictured). Midler! Can you even imagine? 9.14.84, New York: Don’t adjust your screen, we’re all seeing double. 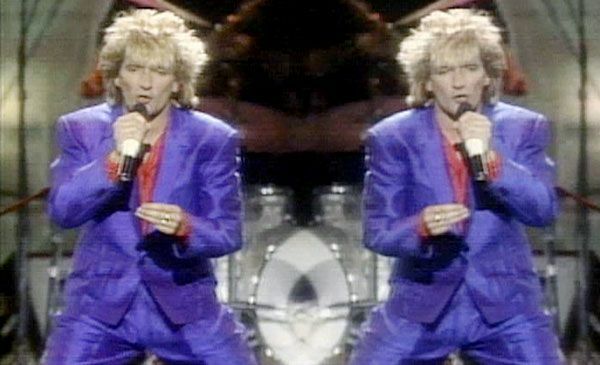 Rod Stewart dances with himself at the first ever Video Music Awards. 9.14.84, New York: In 1984, Michael Jackson’s “Thriller” won Best Overall Performance, Best Choreography and Viewers’ Choice. 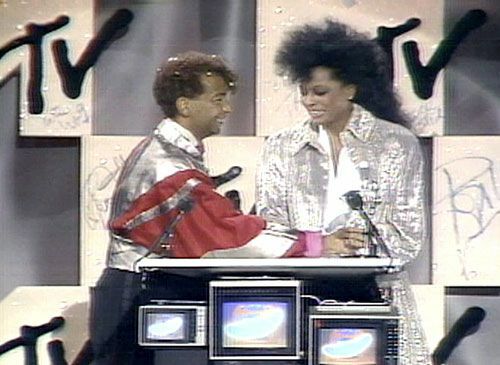 Here, La Toya Jackson shows up in Moonman-inspired fashion to accept her brother’s awards. 9.14.84, New York City: He should be smiling! 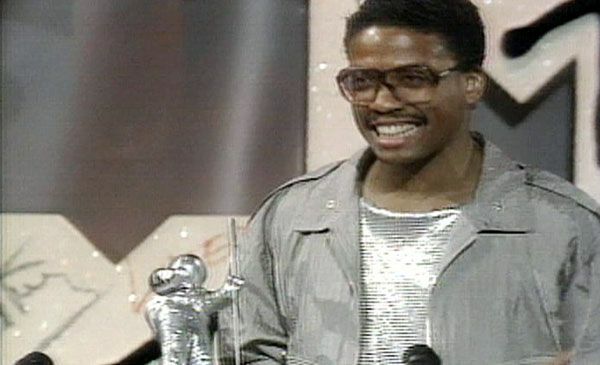 Jazz genius and Funky Headhunter Herbie Hancock won five awards at the 1984 VMAs. 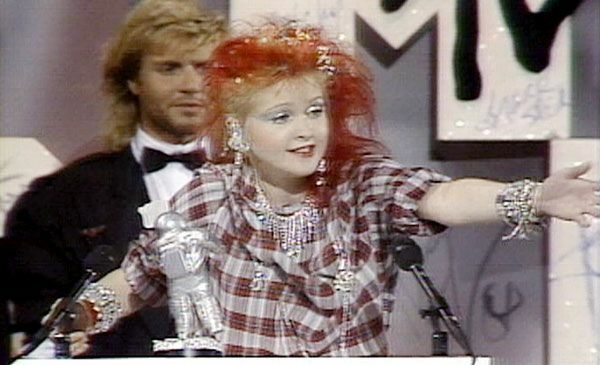 9.14.84, New York City: Cyndi Lauper points out her mother in the audience while accepting the award for Best Female Video, “Girls Just Want To Have Fun,” at the first VMAs. 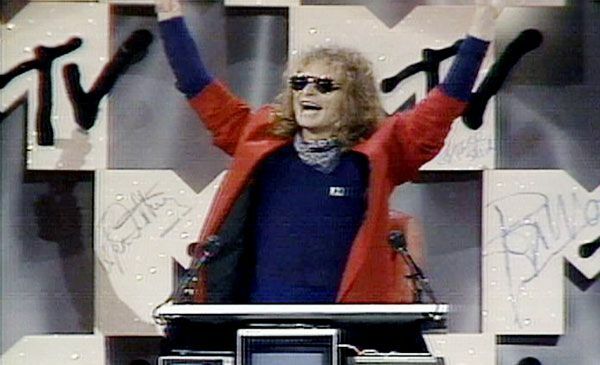 9.14.84, New York City: David Lee Roth celebrates his VMA win, a Best Stage Performance Video Moonman for “Jump,” in typical rockstar fashion. 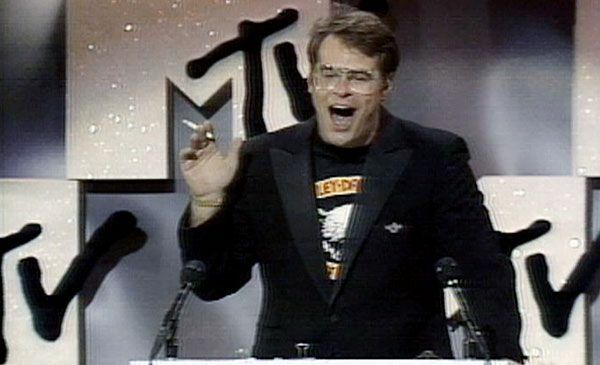 9.14.84, New York City: Host Dan Aykroyd laughs and lights it up on stage at the 1984 Video Music Awards, clearly a totally different era. 9.14.84, New York City: Though she didn’t win for “Borderline,” Madonna rolls around on the ground and creates a stir of her own, as she performs "Like a Virgin" at the '84 VMAs. 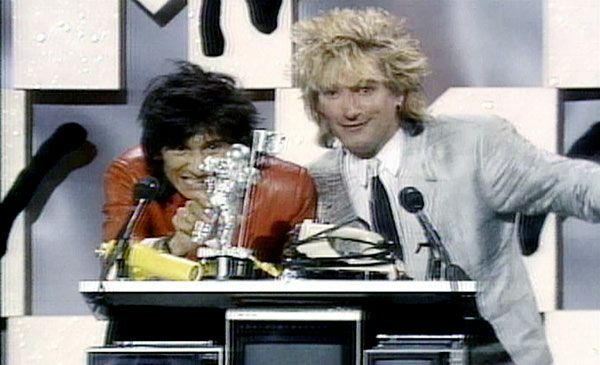 9.14.84, New York City: Former Faces band-mates Rod Stewart and Ron Wood goof around before presenting the Special Recognition Award at the first ever Video Music Awards. 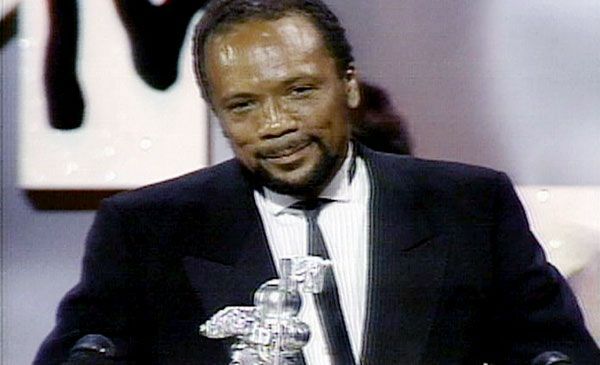 9.14.84, New York City: Super-producer and American music icon Quincy Jones receives the first VMA Special Recognition Award in the skinniest tie on the market. 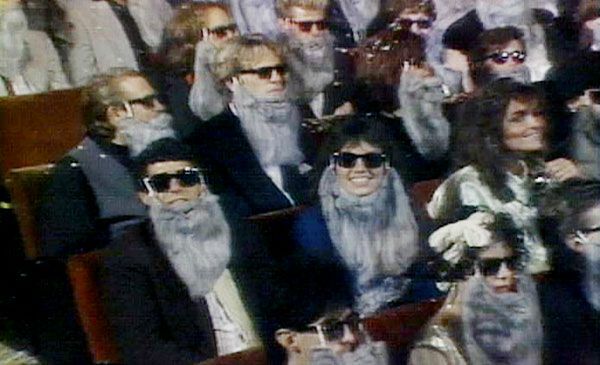 9.14.84, New York City: Long before the asbestos scare, the MTV Video Music Award audience gets into the ZZ Top spirit.